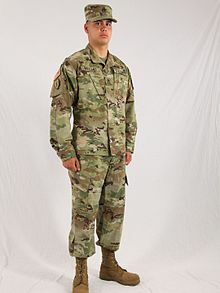 The Army Combat Uniform (ACU) and its flame-retardant variant, the Flame-Resistant Army Combat Uniform (FRACU), are the current battle uniforms worn by the United States Army. The uniform is also used by the U.S. Air Force, where it is known as the Airman Combat Uniform, and by some civilian employees of the U.S. Department of Defense (DoD). A U.S. soldier wearing the Army Combat Uniform (ACU) in the Operational Camouflage Pattern (OCP). U.S. Army soldiers in May 2011, wearing the ACU in the Universal Camouflage Pattern, along with its replacement MultiCam pattern (second from left) in Paktika province, Afghanistan. In early 2004, some U.S. Army soldiers in Iraq were issued the "Close Combat Uniform" a variant of the Desert Camouflage Uniform (DCU) that featured new innovations such as shoulder pockets affixed with hook-and-loop "Velcro" fasteners, chest-worn rank insignia, and a new collar. The experimental features used on the CCU were eventually incorporated into the ACU, which was publicly announced in June 2004. The process of replacing the U.S. Army's woodland pattern BDU and DCU with the ACU was to begin in April 2005. However, the fielding process began two months earlier through the Rapid Fielding Initiative. Soldiers from the 48th Infantry Brigade Combat Team were the first U.S. Army unit to receive the ACU, subsequently deploying the entire Brigade into OIF combat in May 2005. Initial reception of the ACU was mixed, with complaints of insufficient durability and excessive maintenance. The ACU’s infrared tab, closed (left), and opened (right). The ACU of a U.S. Navy sailor attached to a U.S. Army unit during the Iraq War, August 2009. The ACU originally used the Universal Camouflage Pattern (UCP), which used a pixelated pattern of tan, gray and green (Desert Sand 500, Urban Gray 501 and Foliage Green 502) and was intended to work equally well in desert, woodland, and urban environments. It is aesthetically similar to the USMC's MARPAT and Canadian CADPAT camouflage scheme. The shade black was omitted from the uniform since it is highly visible both to the naked eye and to modern optics. Pure black, when viewed through night vision devices, appears excessively dark and creates an undesirable high-contrast image. The pattern proved to be ineffective in certain environments, and is scheduled to be fully phased out of the Army by 30 September 2019. Beginning in late 2010 U.S. Army soldiers deployed to Afghanistan (starting with the 173rd Airborne Brigade) were issued an Army-developed variant of the Crye Precision "MultiCam" pattern (OCP or OEFCP), which was far more effective in Afghanistan's terrain. These flame-retardant uniforms are designed to prevent third-degree burns, along with up to thirty percent of second degree burns. Additionally, the uniforms are treated with the chemical permethrin to help protect soldiers from insect-borne diseases like malaria. Some U.S. Army soldiers during the latter stages of the Iraq War also wore the ACU in MultiCam; some were seen wearing them as late as December 2011, when the United States withdrew its military forces from the country at the end of the war. This particular version has been replaced by the newer ACU in the Operational Camouflage Pattern. In May 2014, the Army unofficially announced that the Operational Camouflage Pattern (OCP) would replace UCP on the ACU. The original "Scorpion" pattern was developed at United States Army Soldier Systems Center by Crye Precision in 2002 for the Objective Force Warrior program. Crye later modified and trademarked their version of the pattern as MultiCam, which was selected for use by U.S. soldiers in Afghanistan in 2010. After talks to officially adopt MultiCam broke down over costs in late 2013, the Army began experimenting with the original Scorpion pattern, creating a variant code named "Scorpion W2", noting that while a pattern can be copyrighted, a color palette cannot and that beyond 50 meters the actual pattern is "not that relevant." The pattern resembles MultiCam with muted greens, light beige, and dark brown colors, but uses fewer beige and brown patches and no vertical twig and branch elements. On 31 July 2014, the Army formally announced that the pattern would begin being issued in uniforms in summer 2015. The official name is intended to emphasize its use beyond Afghanistan to all combatant commands. The UCP pattern is planned to be fully replaced by the OCP on the ACU by 1 October 2019. ACUs printed in OCP first became available for purchase on 1 July 2015, with deployed soldiers already being issued uniforms and equipment in the new pattern. A U.S. Army soldier in June 2005 wearing the ACU in UCP with matching IBA vest and ACH helmet. A U.S. Army soldier in Kunar province, Afghanistan, during Operation Saray in April 2006. 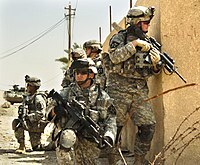 U.S. Army soldiers from the 2nd Infantry Division, patrol the streets of Baghdad, Iraq during the Iraq War in August 2006, while wearing the ACU and Interceptor body armor. The ACU features hook-and-loop fasteners, also known by the genericized trademark Velcro, on its sleeve pockets. The ACU jacket originally used hook-and-loop-backed attachments to secure items such as name tapes, rank insignia, and shoulder patches and tabs, as well as recognition devices such as the U.S. flag patch and the infrared (IR) tab. Originally only pin-on skill badges were authorized for wear on the ACU, with no more than 5 at any one time. In the summer of 2011, regulations were changed to allow for wearing of sew-on embroidered skill badges like the ones worn on the older BDUs. The 5-badge limit remained in effect, and there could be no mixing of sew-on and pin-on badges. 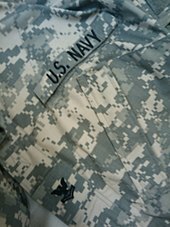 At the same time, the US Army tape, personal nametapes, and rank insignia could be sewn-on at the wearers preference. Skill tabs, such as the President's Hundred Tab, Special Forces, Ranger, and Sapper are worn on the left sleeve pocket flap, and are subject to a 3-tab-only rule. A tab that is an integral part of a unit patch, such as the "Mountain" or "Airborne" tab, is not counted against the rule. The U.S. Army Chaplain insignia is the only authorized army branch insignia to be worn on the ACU. It is centered 1/8 inch above the right name tape. The insignia may be the metal pin-on variety or the black embroidered insignia on digitized fabric with Velcro fasteners. Near Infrared (NIR) Signature Management Technology is incorporated to minimize the infrared silhouette. Permanent IR IFF squares are sewn to each shoulder to help identify friendly personnel when night vision devices are used, and are protected by Velcro tabs in garrison or when not in use. Three U.S. flag insignia are authorized for wear with the ACU: full-color, full-color IR, and subdued IR. The U.S. flag insignia (full-color or subdued) is worn on the right shoulder pocket flap of the ACU coat. The subdued version is only worn as directed under tactical or field conditions. On the right shoulder of the ACU, the U.S. flag is depicted with the union (stars) to the viewer's right, instead of the usual left (flag's own right); this is to give the impression of the flag moving forward with the wearer. Subdued shoulder sleeve insignia are always worn. The jacket's Mandarin collar was intended to be worn up in combat to fit with the Improved Outer Tactical Vest (IOTV) body armor, and worn in the down position otherwise. With the change of pattern to OCP, the Velcro tab that closed the Mandarin collar was removed, along with other Velcro closures. The front closure is zippered and reinforced with Velcro, designed for use with OTV. The tilted chest pockets, cuffs, and elbow pad insert pockets also utilize hook-and-loop closure. There is a three slot pen pocket on the left arm of the jacket, and blouse bellows for increased mobility. The jacket is worn so that its bottom is between the bottom of the pocket and the top of the cargo pocket. In the field, the jacket may be replaced by the flame resistant Army Combat Shirt when worn directly under the IOTV. The ACU trousers (or ACU pants) are worn with a two-inch nylon web belt, and feature Velcro pouches for knee pad inserts, two forward-tilted thigh storage pockets with elastic drawstring and Velcro for closure during movement, and two calf storage pockets one on each pant leg with a Velcro closure. ACU trousers with flame resistant materials are being issued for use in Iraq and Afghanistan. The updates to the ACU trousers in late 2010 included removal of Velcro fasteners from forward-tilted thigh cargo pocket flaps which were replaced with 3 buttons. This change was introduced gradually from 2009 onward and is now in full effect. Two buttons are standard (same function as on BDU trouser cargo pockets), while the third button located at the very end of the pocket can be used to allow for more load and extra volume in cargo pockets. On the small calf pockets the 3-piece Velcro (2 square hook on pocket and one rectangular loop patch on the flap) have been replaced with a single button in 2012. Buttons were re-introduced and replaced Velcro on pockets after numerous complaints from soldiers in the field. The belt loops are of new design. The width has doubled, and there are now 8 of them compared to 7 in the past. The waist adjustment cord has been removed and replaced by the Velcro waistband fine-adjusters, one at each hip. Instead of a knee pocket which could only accommodate soft knee inserts in the past, the knee area now features multi-layered comprehensive design which allows external hard-type knee pads to be inserted and secured. Back of the knee area has Velcro hook and loop patches to further secure knee inserts around the knee area. Cuffs at the bottom of the trousers do not use drawstrings anymore for blousing; those have been again replaced by the Velcro cuff adjusters. Further changes as part of the transition to OCP removed the pockets for insertable knee pads altogether, along with the replacement of more Velcro with buttons. To be able to differentiate the FRACU from ACU at a distance, a small square inch tan patch is affixed to the left sleeve cuff on the jacket and the middle of the left cargo pocket flap on the trousers. A U.S. Army soldier in March 2007, wears a helmet with a UCP camouflage cover during the Iraq War. Typically, the ACU is worn with the Advanced Combat Helmet, a patrol cap, or a boonie hat and/or fleece cap as appropriate in winter months. The patrol cap is a kepi-styled straight-sided, flat-topped soft cap, with a double thick bill and internal pocket. When in garrison, the maroon, tan, brown, and green berets may be worn by paratroopers, rangers, advisors, and special forces respectively. The green micro fleece cap is authorized for field and garrison use outside of unit PT, per local command. A name tape is worn on the back of the patrol cap. Sew-on rank is recommended but pin-on rank is authorized on the ACU Patrol Cap and ACU Boonie Hat. The MICH (Modular Integrated Communications Helmet) Camouflage cover rank must be sewn on if worn but is often not used as the night vision device mount would obstruct it. The ACU is worn with a moisture-wicking sand colored T-shirt. A Tan 499 T-shirt is authorized with ACU-OCPs, and will become the sole authorized T-shirt upon completion of the full transition to OCP in 2019. The ACU is worn with tan Army Combat Boots and olive drab cotton socks. Commercial versions of this boot are authorized without limitation, complying with the following regulations—must be 8 to 10 inches in height, be made of tan rough side out cattle hide leather with a plain toe and tan rubber outsoles, and be without zippers, metal cleats, or side tabs. The Mountain Combat Boot is available for difficult terrain, and the Extreme Cold Vapor Barrier Boots for cold weather. As with the T-shirt, coyote brown boots are authorized with OCP and will become the sole boot authorized following the completion of the transition in 2019. ^ To be discontinued in 2019. ^ "Airmen go hand-to-hand with Afghan National Police". ^ "USA Contracts for New Army Combat Uniforms, New Camo". ^ Larson, Eric H. (2009). "HISTORY AND DEVELOPMENT OF THE US ARMY CLOSE COMBAT UNIFORM (CCU/CU)" (PDF). Camopedia. Archived from the original (PDF) on 20 June 2017. ^ Triggs, Marcia (15 June 2004). "Army unveils new combat uniform, replace Battle Dress Uniform (BDU)". United States Army Public Affairs. United States Department of the Army. Archived from the original on 18 June 2004. Retrieved 18 June 2004. ^ Hirschman, Dave (17 July 2005). "Some Georgia Troops Blister Tattered Desert Uniforms". Atlanta Journal Constitution. Archived from the original on 20 July 2005. Retrieved 16 January 2016. ^ "Advanced Combat Uniform (ACU)" (PDF). October 2010. Archived from the original (PDF) on 27 September 2011. Retrieved 19 January 2011. ^ "Camouflaging Yourself AND Equipment". Kit Up!. 2 December 2009. Retrieved 7 October 2016. ^ "Army ACU Replacement Fielding Plan Overview" (PDF). ^ Army Combat Uniform Ensemble, paragraph 5L. ^ a b "PEO Soldier to Unveil New Army Combat Shirt". ^ "Fleece/Knit Cap Authorization for the ACU" (PDF). Wikimedia Commons has media related to Army Combat Uniform.